On January 26, 1797, the Pinckneys were ordered to leave France; they moved to Amsterdam to await further instructions from home. MARY STEAD PINCKNEY, in a letter to her niece Mary, reflects on the change of abode. Amsterdam March 16th 1797. . . . I should be glad to amuse you with something new of Amsterdam, but . . . . I cannot but be surprised to find your uncle, Eliza & myself sitting quietly by the fire side in Amsterdam as if we were all at home [in Charleston, S.C.]. And yet this is really the case. I cannot describe to you the difference of my feelings here and at Paris. I find it difficult to explain it to myself. In the latter city I had always something in view, something to see. I was ever on the wing, and always amused. Here I am seated as tranquilly with our botanical books, or work, or ink-stand before me as if I had resided here all my life, & had seen everything. . . . There does not seem to be any bustle in this great city; it is as quiet as Charleston. . . .
A month later, Mrs. Pinckney seems to have decided to be “on the wing” again for she, accompanied by her husband and some friends, decided to visit Haarlem, as she wrote her niece, Eliza Izard. . . . . The country is even more flat than that of Carolina, but the beautiful green meadows, the number of country seats with their neat gardens, bridges & summer houses, the numerous windmills, the trees with the buds, some opening into leaf render’d the view so agreeable that we forgot hills were necessary to form a perfect landscape. After an hour’s ride we crossed the Haarlem meer, or lake of Haarlem, & had it on each side with its numerous sails, during the greater part of the distance to Haarlem. If you will take the trouble of looking on the map you will see that we crossed it from east to west, & that Amsterdam appears quite close to its east side and Haarlem immediately opposite on the west. We drove through Haarlem, which is so clean that you might eat off the stones, & has many handsome houses and canals border’d with trees running through the principal streets, to [our] lodgings . . . .
Mary Stead Pinckney’s last letter was written from The Hague on August 23rd, 1797. The Pinckneys returned to Paris the following month; General Pinckney, now assisted by John Marshall and Elbridge Gerry, attempted to come to an understanding with France but their efforts ended in failure. The Pinckneys left Paris in April 1798 to return to America. Mary S. Pinckney’s letterbook is at the Library of Congress. Excerpts from Letter-book of Mary Stead Pinckney, November 14th, 1796 to August 29th, 1797 (N.Y.: The Grolier Club, 1946), pp. 60-61, 66-68. See also In the Words of Women, pp. 325-6. 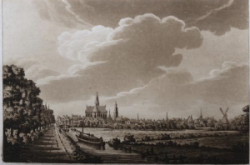 The aquatint of “Haarlem Meer from the Amsterdam Road” is by Samuel Ireland from his Picturesque tour through Holland, Brabant and part of France made in the autumn of 1789. Read about the electrostatic generator HERE. Continuing the topic of “searching for a new home”, compare the experience of MARY STEAD PINCKNEY in Paris. Upon arriving on December 5, 1796, Mary Stead Pinckney and her husband, General Charles Cotesworth Pinckney were far less fortunate in their reception in a new country than the family de la Tour du Pin had been in the United States! President Washington had appointed the General as minister plenipotentiary to France to replace James Monroe. The relations between the United States and France were at a low ebb: the former desperately seeking to maintain its neutrality in the war between England and France, the latter outraged by, what it viewed, as the failure of the United States to adhere to the terms of the Franco-American Treaty of 1778. Until those grievances were addressed, France’s Directoire refused to acknowledge Pinckney’s diplomatic status or even to talk with him. Mary Stead Pinckney, born in Charleston, South Carolina c. 1751, had moved to London at an early age, and had lived in England or on the continent from 1776 until 1783, when she returned to the U.S. In 1786, she married the widower Charles C. Pinckney and eagerly joined him on his mission. She described their arrival in Paris to her cousin, Mrs. Margaret Manigault, a daughter of South Carolina Senator Ralph Izard and his wife Alice DeLancey Izard. Paris, Tuesday Decr. 13th 1796Here is such a concourse of strangers, such an influx of ministers, my dear cousin, from all the Kingdoms and Principalities of Europe that I have no favorable report to make you of the expence of an establishment in this city. Lodgings now are hardly to be had, houses scarce & high, every article of furniture dear, china excessively so, and the articles of dress, though more moderate than in our country, by no means to be called cheap. . . . I should not have been thus precipitate in giving so general & unfavorable a report . . . had it not been probable . . . that that time will not now arrive, the executive of this republic having notified yesterday to Mr. Monroe that they would not receive a minister from ours till the grievances of which they complain are redressed. As this event has been so lately announced I can give you no account of what is to become of ourselves—whether we are immediately to leave Paris, or to finish our winter in it . . . We pay for 5 indifferent rooms, two of which smoke dreadfully, 25 louis a month or 8 p week, and we are obliged to hire them from week to week. They are at the hotel des Tuileries, Rue Honoré, and very near the gardens, tho’ they do not look into them. . . . Since the first 3 mornings we have had our own tea equipage, and have found our own breakfast, milk and bread excepted, & our traiteurs [restaurant owner] bill for dinner for five days supper for one (the evening we arrived, for we eat no supper) and breakfast for three, amounts to 601 livres or 25 louis, and we have had no company only one day, and then only three persons in addition to our own party of five—we pay 18 louis a month for a carriage, and three livres a day besides for the coachman. . . . Then there is wood, which, as we were not here to lay it in during the summer months, stand us in 79 livres for 2 voyes—a voye is less than a cord. . . . In two days we shall know whether wee are to remain here this winter or wander further in quest of peace. The “party of five” consisted of the General’s youngest daughter, Eliza; Ralph S. Izard, Mrs. Pinckney’s nephew; a black maid, Auba; and a servant, James. They kept busy sightseeing, attending the theater or the opera, going shopping, and visiting with James Monroe and his wife, Elizabeth Kortright Monroe, and other Americans, but they had no contact with the French. Moreover, what was to be done about Eliza’s and Ralph’s education? Could they go to school in Paris? Mrs. Pinckney, who spoke French, was vexed that family members were not able to improve their French due to their isolation by the Directoire. More about the Pinckneys in Europe in the next post. Mary S. Pinckney’s letterbook is at the Library of Congress. Excerpts from Letter-book of Mary Stead Pinckney, November 14th, 1796 to August 29th, 1797 (N.Y.: The Grolier Club, 1946), pp. 28-30. The painting is Charles Cotesworth Pinckney is at the National Portrait Gallery, Smithsonian Institution. Mary Stead Pinckney was in Paris in January of 1798. (See another post about her here.) Her husband, Charles Cotesworth Pinckney, had been sent there in 1796 to replace James Monroe as United States minister to France. Relations between France and the United States had worsened given the decision of the United States to remain neutral during the war then being waged between the French and British; France believed it was entitled to American support based on the treaty of 1778. The Jay Treaty of 1794, perceived as unduly advantageous to the British, caused relations to deteriorate further. Pinckney was denied accreditation and, indeed, was ordered to leave the country. Charles and Mary went to Holland where they remained for some months, returning to Paris in September of 1797. There Pinckney became part of a three-man commission designated by the United States to sort out relations between the two countries. Negotiations—known as the XYZ Affair—failed in the face of attempts by France to extort money from the United States. The Pinckneys returned to the United Sates in 1798. Following is the letter Mary Stead Pinckney wrote to her sister Elizabeth Stead Izard on January 6, 1798. We have begun our new year in this city, my dear sister, but I am sure I shall not pretend to the spirit of prophecy and venture to foretell where we shall finish it. I hope I may be allowed to wish ourselves, as also you & yours, as happy a year as is consistent with our imperfect nature. After taking such a voyage I should like to see a little more of Europe merely to gratify curiosity, but, believe me, our country is capable of bestowing more real happiness than is to be found out of it. I mean for those who have the wherewith to live comfortable. As to the society of Paris, I know no more of it except by hearsay than you do; & with regard to public amusements they soon tire. My morning excursions procure me the most pleasure, and yet it is too cold and damp not to suffer from visiting churches & museums, and I dare not put them off to a milder season lest I should not then be here. . . . but I am wishing it was spring that I might make excursions round the beautiful environs of Paris. Yet we have no cards of hospitality, and if they are determined to consider us as private americans only are liable to be stopped every time we go out. . . . I will not risk the safety of my letters by meddling with politicks, and tho’ the citizens allow themselves greater latitude on this subject than I expected, it is still a dangerous subject; and with regard to letters, I am told the owners of vessels both coming from & going to A. are so apprehensive for their cargoes that they generally throw them all into the sea. I hope therefore you will either send copies or write very often. I wish particularly to know whether in case we are recalled you will venture to let us leave Ralph [Elizabeth Izard’s son] at school in St. Germains, or what you would wish to have done with him. He is losing all his time, & at present has no opportunity of learning even french. We should not hesitate, but send him immediately to St. Germains, tho’ but for a week, were it not for the expence of the outfit—for each student must have a bedstead, 4 mattresses, a pr of sheets, 3 doz. napkins, a silver cup, fork and spoon, and our stay is so uncertain. Sometimes we think of leaving him there if we go to Amsterdam; & then again I am fearful lest he should get sick &c: in a country where he will have no friends. . . . We are indeed quite puzzled what to do with him. Eliza [Ralph’s sister] too is losing all she has learnt—no instrument—no masters. We changed our lodgings yesterday—these are rather more comfortable & quiet, but they are dark, and the situation much less agreeable; but we were in the Road to Ruin where we were, and lived in the most disagreeable manner. We paid 67 louis d’ors for 21 dinners, without the satisfaction of seeing one friend, except on New Year’s day, when Mr. & Mrs. Middleton [relatives of Charles Pinckney’s first wife] . . . dined with us. . . .
Friday evening—I have been running about Paris all this morning instead of writing. . . . I see very little jewellry or gold trinkets in the shops; and you will be surprised to hear I have not yet been able to meet with a pair of sleeve buttons for Ralph. I am persuaded there is greater choice, and neater work in London. I have not seen one pretty watch. Yet there appears to be a great abundance of all the necessaries of life. I suppose I have been a dozen times at least to the Palais Égalité, and I am as much amused with the shops as any child can be. Pray remember me affect. to &c: &c: and tell us all about Xmas. 4 months and not a line from any of you. Deplorable. . . .
As always, it seems, visitors to Paris see the sights, visit museums and go shopping. The letter has been arranged in paragraphs to make for easier reading. The Letter-book of Mary Stead Pinckney can be found online HERE pages 42-45.